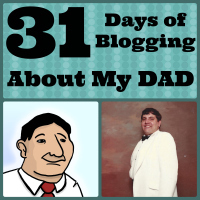 Here we are at Day 7 of the 31 Days of Blogging Challenge. 1 week down…3 more to go. We’re almost at 80 people on the facebook page. I didn’t do much today other than manage the facebook page. I still have a few emails I need to answer. I haven’t decided what I want to say to these people. It’s such a weird thing having all these emails and comments flowing in…it’s almost unreal. Somedays I read all the notes and messages and ask myself if this is real? I think a lot of the comments have been really comforting. When my dad died it was the first time many of us had to deal with the death of a loved one. I remember when I was really little like 5ish…my great grandma died at the age 100. But I didn’t really know her that well. I remember visiting her a few times but it didn’t really click. When my Dad passed away all my cousins were between the ages of 5 and 16. It was the first time many of us experienced something like this. Even many of my Dad’s students that have been emailing me have been saying the same thing. It was the first time any of them had to deal with the death of a loved one. I can remember because we were so young we all got in trouble at the funeral home. That is what happenned back in the day before play/game rooms and hand held electronic devices. In the basement they had a water fountain that had these weird cups that you could take a part and we were all taking them apart and made flowers out of them…eventually they took all the cups away hahahahaha…kids will be kids I guess no matter where they are…and no matter how times change…they stay the same. My Florida Plunge Guest Post!